This is it, spread out on the table like a goddamn Thanksgiving feast. I hit some hardware stores, craft stores, and liquor stores in the last couple of days getting all the tools, glue, pine essential oils, and Leinenkugel's Original I'd need to get these things all packaged up. 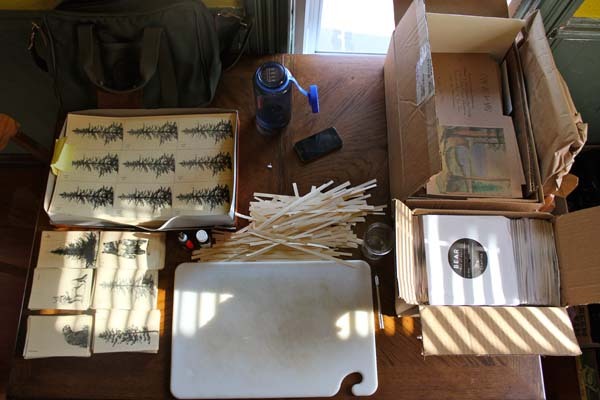 I sat down with my wares at 3pm today, threw a documentary about the Redwood trees on my laptop and got to work. Here it is 7:30pm and I'm calling it quits for tonight—only half done. It's a lot of work being 100% independent as an artist or band, but when someone holds the finished product and knows every little minuscule piece went through one our hands, it means something special. That's what I've always honored about some of my favorite artists, and I'm just trying to follow those footsteps. Last week Cecelia and I worked out some harmony stuff over at her place. Meanwhile, one of my absolute favorite people in the world, Jon Klocek, has signed on to play keyboards/synthesizers/organs with BEAR. We're gonna try and get him up to speed at least enough so he can play on a few songs at the 7" release show July 19th. Noise, noise, noise. Got a couple fresh songs in the hopper that we'll start working on at band practice Wednesday night, too. It's gonna be a good couple of weeks here, folks. Our next show is July 11th at Big V's in St. Paul. One of the best places to play, in my opinion. Won't you come visit us? We may or may not have a limited number of our 7" records available. Oh, and Redwood trees are the most amazing things.